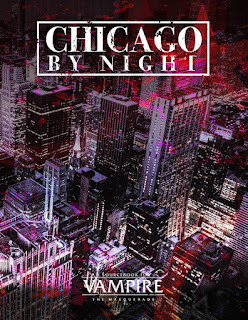 I am one of the biggest fans of Chicago by Night 1st Edition that exists. For those who wonder what the hell I'm talking about, it is a supplement created in 1992 for the tabletop role-playing game Vampire: The Masquerade. The premise was the city of Chicago was secretly controlled by vampires ranging from the beautiful Annabelle to the unliving Al Capone. Further figures like Critias of Athens, Helen of Troy, and Meneleus were also undead inhabiting the Windy City. You, as newly created vampires, had the job of navigating the city's complicated politics in order to avoid another sunrise. Eventually, the focus of the game changed as it became less about city-based gameplay and more about globe-trotting adventures between sects. 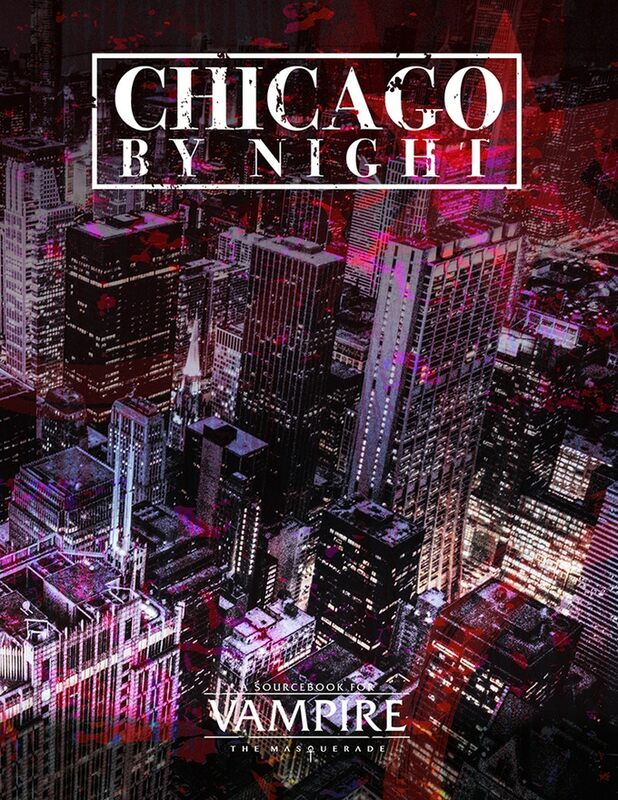 Chicago by Night had a good half of its vampire population slaughtered by werewolves and after a follow-up edition, Chicago by Night 2nd Edition, ceased to be relevant to the setting for the rest of the original line's history. However, the legend of Chicago by Night would not die. With the return of Vampire: The Masquerade after a decade-long absence with the Vampire 20th Anniversary line, it was to my delight they managed to bring back the supplement. I had done a read through of the supplement on RPG.net and also had been touting it for years. I wanted to see how old friends, fictional or not, had adapted to the 21st century. Presently, they're raising money for the supplement on Kickstarter. They've already passed the funds necessary for the supplement but are now raising funds for supplements to the setting. I hope people will chip in a bit and pick up a copy if they have any interest in vampires and role-playing games. What I've seen so far of it has been awesome. Thankfully, Matthew Dawkins, one of the writers of the supplement has decided to sit down with me and give an interview about this awesome book. He was a chief contributor to Beckett's Jyhad Diary and is the man behind the excellent Gentleman's Guide to Vampires Youtube video series. 1. What inspired making a 5th Edition of Chicago by Night? Chicago was the iconic city for Vampire: The Masquerade for the longest time, so it made sense to revisit it, give it a facelift, a lot of new plots and characters, and bring it forward into fifth edition. 2. What was your thoughts on the original supplement? I'm a big fan of a lot of the old city sourcebooks, with Chicago being in my top three. Chicago was the template that many books went on to follow, and my hope is that any city sourcebooks following this one will match or build on its design. My favourite supplement for that period and location would be Milwaukee by Night, which still ranks as my #1 city sourcebook. I love it due to its simplicity. It has a lot of stereotypical characters in its pages, but I enjoy that, and consider it an excellent introductory book for anyone looking to get into Vampire. 4. Did you prefer 1st Edition or 2nd Edition? I don't really have a preference between first and second edition Chicago by Night, as they both have a lot of strong elements. The thing I feel is missing in second edition are the chronicle hooks at the back of first edition, but it makes up for it with a more diverse, interesting cast of characters. 5. What can players expect from this supplement? Players can expect rules for playing the Lasombra, lots of interesting Kindred with whom a character can form alliances or rivalries, benefits and drawbacks for operating out of certain parts of the city, and a beautiful campaign setting in which to grow a character. 6. What was the design philosophy for updating Chicago and its characters to the year 2018? The core design philosophy was to ensure this book had the horror of the Beast, Humanity, and Hierarchy. Bleeding out from that we strived to introduce a diverse cast of characters with multiple interesting agendas, plentiful plots a Storyteller can introduce to their chronicle, and to make the book feel exactly as Chicago should. 7. Do you have a favorite character from the book? My favourite character is a new Nosferatu named Adze. He's a lot of fun and teases the possibility of Chicago moving away from the Camarilla. 8. What sort of changes can we expect to the setting with the transition to 5th Edition? There's a new Prince, some new Primogen, old foes might have fallen, new ones may have arisen. The changes to the Camarilla and Anarchs in fifth edition sends ripples across Chicago as well, meaning previously quiet clans receive prominent position while others, once powerful, sink into the shadows. 9. The Lasombra clan will be detailed in this book. Can you explain why they'll be included in this book, in or out of universe? I pitched for the Lasombra to be included in this book for a few reasons: 1.) I wanted them playable in V5, 2.) There's a strong metaplot reason for them to be in the North American crown jewel of the Camarilla, and 3.) It adds an exciting plot vein to this book. 10. The Kickstarter lists some additional supplements that have already been unlocked. Can you tell us a bit about them? The Chicago Dossiers will be books largely consisting of in-universe artifacts you can print and use for your chronicles, though there's the hope it will receive expansion so we can include some more characters and loresheets in there too. Let the Streets Run Red is a chronicles book a little like the Succubus Club sourcebook of old, with as many as four decent-sized chronicles, the first being set in Chicago, the last (if we reach it) going out as far as Milwaukee and Indianapolis. 11. How has your experience been on writing for 5E? I've enjoyed my work on V5 a great deal. Certainly, it's had its stresses from time to time. That's natural for a new edition of a game, especially when a new team has been put together. It can also sometimes prove tricky to create something that exactly matches what the licence owner (White Wolf, in this case) would like to see. But all in all, I'm very pleased with how V5 has turned out, and especially how Chicago is looking. 12. You wrote about the Ministry (formerly the Followers of Set) for the Guide to the Anarchs, right? What can we expect to find out about them in that book? The Ministry have gone through a bit of a re-brand, ostensibly accepting a plethora of non-Caine faiths into their ranks and re-embracing their polytheistic roots. They're the spiritual arm of the Anarch Movement, providing advice to fellow Anarchs on how to temper their Beast by working for a higher power, while of course profiteering from other vampires' spiritual corrosion. I've heard a lot of good things from fans of the Setites who were apprehensive about the Ministry, but enjoy the fresh coat of paint the clan's received. 13. What projects will you be working on after Chicago by Night? They Came from Beneath the Sea!, the Contagion Chronicle, Book of Oblivion, Mummy: The Curse, and Shunned by the Moon are the big projects on my list right now. There's also the stretch goals following the Chicago by Night Kickstarter, but we won't get started on them until we know how big they're going to be. I wish I could have gone into more detail. Also force him to say what he thought of specific characters! CURSE HIS ILLUSIVE CAPPADOCIAN NATURE! Always good fun, and there are few Chicago fans as dedicated as Charles!